“Beyonce Hair Styles”Beyonce is hitting front pages these day with her newly released singles, “If I were a boy” and “Single Ladies (Put a Ring on It)” The album is due to be released on November 18th. But, that’s not all, she’s also been busy working on the film, “Cadillac Records,” due at the theaters on December 5th. Here she’ll be portraying the late, great blues singer, Etta James. 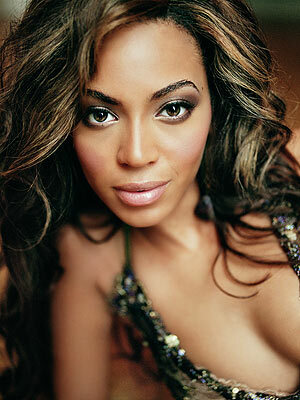 Beyonce hair styles are a no brainer, Beyonce has the versatile, heart shaped face shape! There is little that you could do wrong, as a hairdresser, in creating hair styles for this face shape. But, clearly when features are so great, let em shine!! 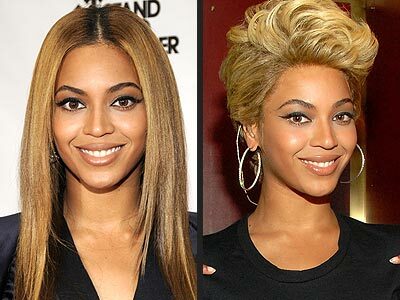 Doesn’t matter how new or old the picture, Beyonce’s hair always look best with her hair back and off her face. Although she wears slicked back well, a little bit of height and fullness on top when all pulled back, makes her eyes, smile and cheekbones pop! Just to show a little contrast, the hair style Beyonce wears in the upcoming film, “Cadillac Records” is one of the rare shapes that doesn’t do so well to flatter Beyonce’s heart shape face. (I say this lightly, as after all, she still is gorgeous) The old “bubble cut” is too top heavy with tightly tapering sides and no weight or length on the bottom to balance. This hair shape on a strong heart shaped face can make the chin look more ‘pointy’ at different angles as below. The middle part is also not the most flattering on a heart shape face, whether the hair is flat or full. Usually with this center part the top becomes too flat. An off center part works better on a heart shaped face in adding a little asymmetrical look. October 22, 2012 By: Barb Quinn Hairstyle Blog Leave your comments (1), Your input matters. It’s imperative to have damp hair when you coat your hair with the rinse-out conditioner. The conditioner will lock in the moisture from the dampness of your hair and give it a naturally-slicked look without as much residue as that left by styling gels and styling creams.